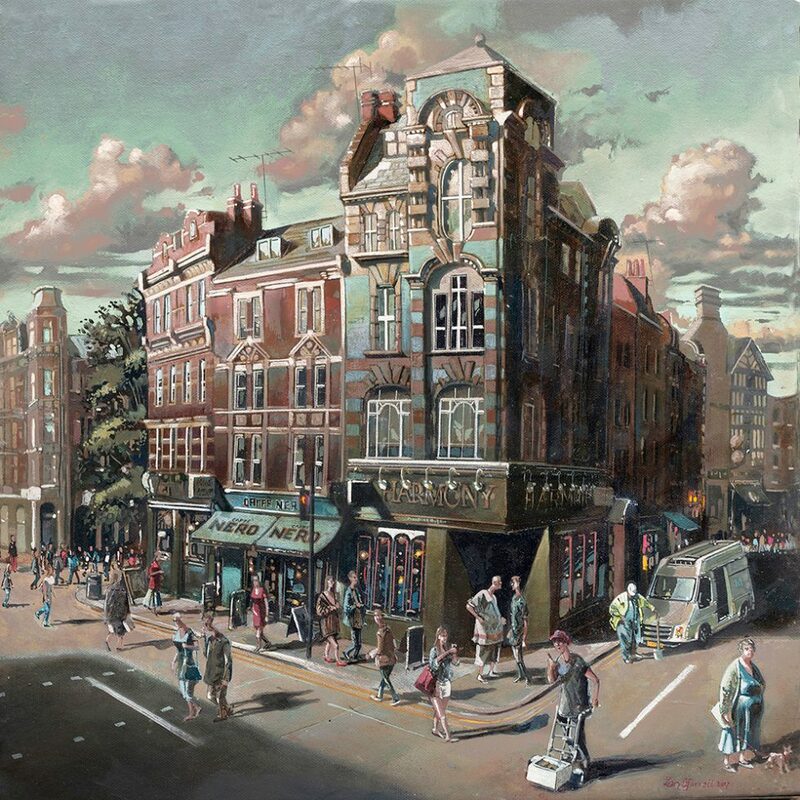 This painting of Charing Cross Road is available to buy here. In my painting, I have chosen the view of the junction of Charing Cross Road (left to right) and Old Compton Street (ahead). At the far left is Cambridge Circus with the Junction of Shaftsbury Avenue. This road running north out of Westminster and Trafalgar Square must have been there for many hundreds of years, although in the late 19th Century, the road was widened to cope with the ever growing city and was named Charing Cross Road. In the 20th Century, it became famous for its antiquarian book shops. This was made possible because the block many were in, was owned by an housing association so the rents above subsidised the book shops below. In 2001, however, the housing association ramped up the rents so many needed to close down. That said, a few are still clinging on and Charing Cross Road is still the go to place for books in London. Why paint this particular scene? It is not easy to say what draws me to a subject, although in London, I often pause on odd street corners to just look about until something clicks. This view just felt right and I thought I would use this page to explain why if I can. I am certainly attracted to the frenetic business of normal daily life. Initially, the big city can look like a sea of non faces streaming by, you can quite easily believe that you alone are the only ‘real’ human. On closer inspection, however, you perceive that each individual has found themself there in that spot for a specific, and unique reason. I notice people in the street and put questions to myself. Why are you here? Who is on your phone? Is that dog your only companion? Do you know the person you are arguing with? When I paint the characters in my work, I make efforts to reflect these questions. I occasionally even give them names. In fact if I am having trouble painting one my characters, I find the act of giving them a name and a story helps bring them together. Essentially, we all have a story, and everyone else’s story, in the grand scheme of things, is as important as our own. It’s a common habit never to look up in big cities. This is of course exacerbated by the deadly traffic which needs to be avoided in the roads. On the pavements too you need to weave and dodge around your fellow humans who are passing in the other direction. All that coupled together with expertly placed advertising, there is simply no opportunity to look above eye level. If you did take a few moments each day to pause and look up then you would notice some real gems. Charing Cross Road has a fine collection of wonderful buildings where you can see that the architect has put genuine care to create an environment with humanity at its heart. Especially pleasing, is that many of the structures have differing influences. They have not tried (or have been made) to match the roof heights either. To me at least, this small city block is splendid. The wonderful building on the corner with its jade ceramic tiles, flamboyant classical arches and stone blocks really work with its more conservative neighbour next door. The odd couple. It was designed in 1904 by Charles H Worley. He and his brother Robert, owned a London based architectural firm which made a name for themselves for traditional, though often striking designs. There is a very similar building by the same architect on Moore Street (now an Ed’s Diner) at the other end of the block on the right had side of the painting, though there is no evidence that it was ever intended to link the two in a single scheme. 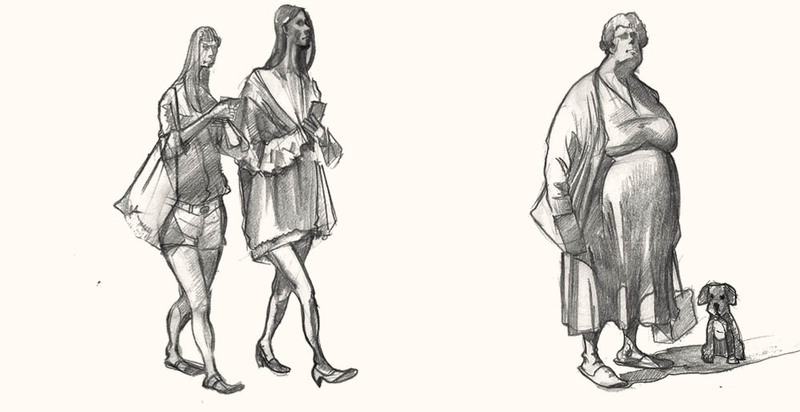 In this painting, I have tried to capture a few seconds on a single day in London. I have not tried to sugar coat the view, I have kept in the franchises of Neros and Harmony. Also, the modern delivery van because that is what was there on the day. There is something special about the ordinary world. It’s all very simple really. Love your pictures Liam. You are very talented and like your use of colour, it brings out the vibrancy of the scene and creates more interest. Great painting, in my opinion, you perfectly captured the mood of the day.